This is Nasrul, he sacrificed his whole 2 week holiday to stay in our KL apartment to care of the injured WuNan while everyone else went back to their respective hometowns & had a good rest. This is the injured Wunan who jumped from the top of our 7 floor building. Nas had plans for the holidays but he gave them all up. He spent the holidays caring for Nesa's injured WuNan, his baby Sho'el & my beloved Shadow. I did not bring Shadow with me because Nas wanted the siblings to stay together. If they are seperated for too long, they may return as strangers & become territorial. His original plan was to take the 3 cats home with him to Seremban. But WuNan's accident complicated the matter & he had to stay back in KL. 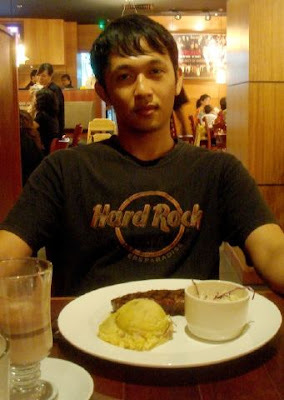 So he picked me up from KL Sentral & we headed to Tony Roma's @ Mid Valley for dinner on me! 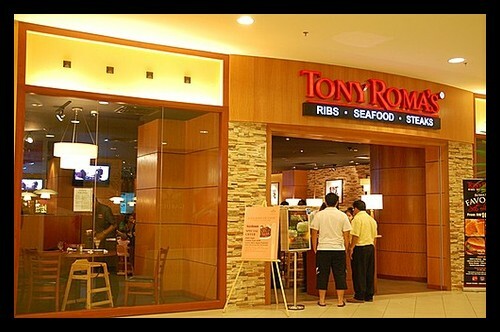 This is what Tony Roma's in Mid Valley Megamall looks like. Unfortunately, we went on a Malaysian Father's Day so the restaurant was full. Fortunately, there was a hot young waitress, Ain, at the front desk who was pleasing to look at & very professional with her work. She was friendly even though she was under a lot of pressure. She put us in a waiting list & promised to call us if there was a table. She had a table spread out for us. Tony Roma's here we come! 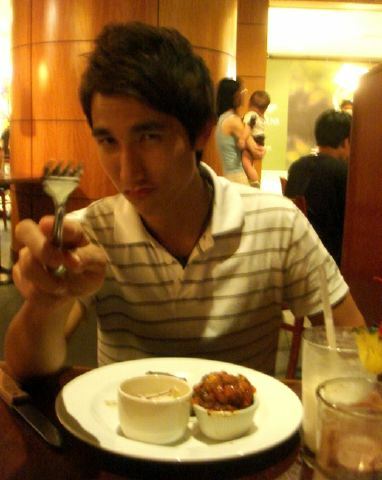 That evening, I had my very first piña colada. Yes, it was mentioned in the Sean Kingston song, Take You There. It was a very refleshing & sweet mix of blended ice with rich coconut cream & pineapple pieces. The original drink is an alcoholic drink composed of rum, pineapple juice & coconut cream in crushed ice but this one was just as welcome a treat on such a hot day! We skipped entrées because (from previous experience of having just a sandwich at Tony Roma's @ Pavillion which has really huge) I expected a large serving in the mains. I asked for a medium-rare steak because I wanted to taste a little blood & sink my teeth into juicy chewy meat. Well... dont judge a book by its cover! Hey, it's black in the middle! It's well done! I wanted medium rare! Oh, well... Here goes nothing! Sigh... I tasted better cheaper steak. After I was done, the waiter came & asked if he could clear the table. We consented but the way he did it was not dignifying. Now stacking is fine, but stacking on the table infront of a customer is NOT! Esp when you have to empty one plate onto another infront of him! That just ruined my experience! Just a chat... ntg more ok?! In fact, I might even discourage people from trying you out! Unless I prepare it myself!